The Cult of the White Worm! Siciliano is back with more blending of various authors! Gentle giant Adam Seton hires Holmes to go to Whitby to investigate a mystery. (Readers may or may not know that Stoker was often referred to as a gentle giant!) Much like “The Hound of the Baskervilles,” the story starts with a legend passed down through generations of his girlfriend’s family. It speaks of a battle between the legendary White Worm and a knight of old, Sir Michael Marsh. Having defeated the White Worm, Marsh’s family becomes cursed. Every female in Marsh’s line was to become the host of the White Worm! As usual with Siciliano, the story is not recounted by Watson. In fact, Holmes is openly dismissive of Watson’s value as a companion. The tale is told by Holmes’ cousin Doctor Henry Vernier, who accompanies Holmes on “serious adventures.” Vernier’s wife, Doctor Michelle Doudet Vernier always plays a role in these continuing stories. 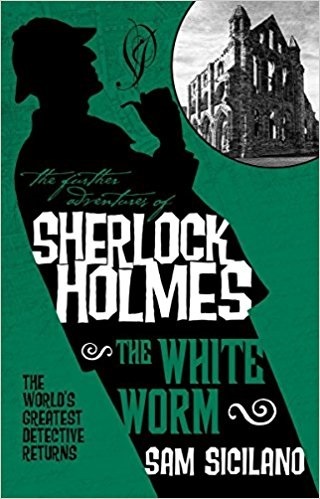 If you are willing to deal with Watson being sidelined, (at one point when the client asks if this is Doctor Watson both Vernier and Holmes answer “No!” simultaneously) you might find the stories enjoyable.